Last round of the February Tournament, and I lost. I actually feel a bit disappointed with myself, as I was hoping for as good a game as last week, but that did not happen. Partly this must be due to 'non-chess' circumstances, but also my opponent was 180 points above me, so probably to be expected ! I believe I have to re-think how I approach chess, whether I am looking for an improvement in rating, or more for a satisfaction of playing an enjoyable game : or both ! A happy combination of circumstances ( at least for me ) means I am now on a team in the ICC Team 4545 League. Chessmasters is the team name and I will be playing from next week in the U1600, Erg section. Another Scotch..no, that's not to you, barman, but I managed to play another Scotch Opening in the tournament, and despite the same result as my first from two weeks ago, this is much closer. True, a loss on time, but I felt that I played well for most of the game. Well, I made 20 games, which is the "entry point" for a few competitions/tournaments at ICC. I've now put myself on the T4545 League list, so if there are ant teams wanting another player, please contact me. Additionally, 20 games allows play in the STC Bunch competitions, so I should be able to play in the Sunday Swiss now. The downside was that Monday's games were a bit of a disaster ! As Black : 1.e4 is the main opener ( 9 of 11 ), developing into a King's Gambit most often. 1.d4 only played twice !! So, advice so far is to prepare against the King's Gambit as Black, and the Sicilian as White. Let's hope I can take my own advice ! Tonight is the third 60 minute match of the month. I should have White, but will be matched against a higher rated opponent. "Man is a fickle and disreputable creature and perhaps, like a chess player, is interested in the process of attaining his goal, rather than the goal itself"
Max Euwe - Too cold to play outdoor chess ! ...following which I generated what I thought was a good attack. However, with 12...Ng3, I mis-calculated the various options and although I went up another pawn soon after with a mistake by White, I allowed a nasty Bh6 which cramped me. Yet again, I spent far too much time thinking, and by this time ( move 18 ) only had about 10 minutes left. Mistakes on both sides follow, but despite what seems like a dangerous king-side attack from White (with a Bishop on h6, and a Queen not far behind ), I found the correct moves and never really felt threatened by the attack, much more by my own time-trouble. 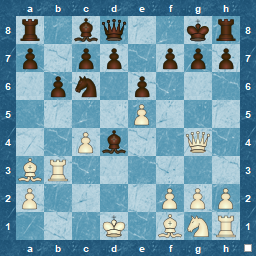 33.Re7 seemed good, but was a blunder, and even though I lost the exchange there, White's bishop prevented his Queen from making any check threats. After 33...Rxe7 34.Bxe7, the natural check 34...Qc6 was wrong, and better was 34...Re8 35.Re1 d2 which would have finished it. If I had more time, I think White would have resigned. I managed to get away with 35...Qc2+, which should have been answered with Rd2. Finally, I missed an obvious mate at move 38, but won it in the end, mainly because, even though White had a huge amount of time compared to me, he played too quickly. I am looking forward to next week, when I should have White ( & probably a higher-rated opponent ). Two Internet chess games from ICC..one win, one loss, but both enjoyable....!